Amazon Marketing Services is one of the pet projects of Amazon which they have so beautifully designed to make digital marketing easily comprehensible and a self-service for the vendors. It gives you a platform to display your Ads as per your best selling product and as per your requirement. It promotes your brand and boosts product visibility. This service is available for all the registered vendors with amazon. It drives sales and increases brand awareness with keyword-targeted ads above the search result, making it easier for customers to locate their correct product in an ocean of options. It provides visibility to three of your best selling products which are identified by a unique block of 10 letters or words that identify items. These unique block of letters and numbers are called ASIN – Amazon Standard Identification Numbers. Therefore, HSA helps you display three such ASIN’s. It provides with various customizable options like modifying your campaign’s image, headline and landing page experience. This helps it making your campaign more appealing and user friendly. 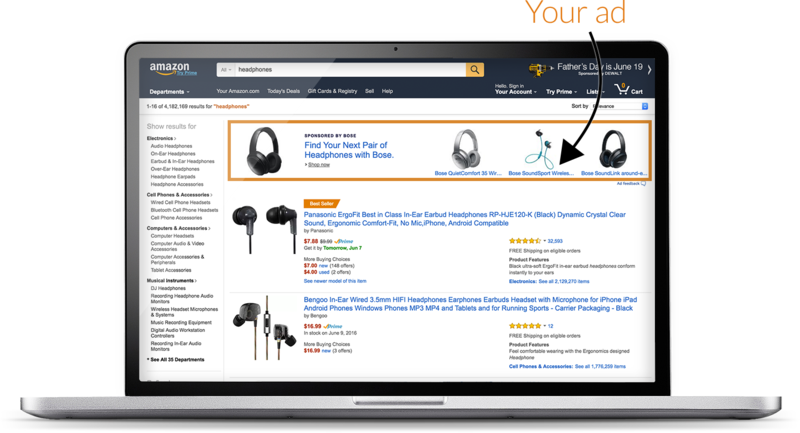 Always on Approach: According to a Radial Study, over half of Amazon’s US shoppers make multiple purchases per month and about 80% make purchases once a month. These statistics reveal that vendors on Amazon have to be always on the go to cater to the needs of their customers. HSA is one service that allows them to run their campaign on a daily basis and convert these customers automatically, in real time, year round. HSA also provides the flexibility of running multiple campaigns at one given point of time for different line of products. Branded Product Keywords: Target your brand name and product name or some variation of it. This gives an on point focus directly to your brand and thereby increasing its awareness amongst the customers. 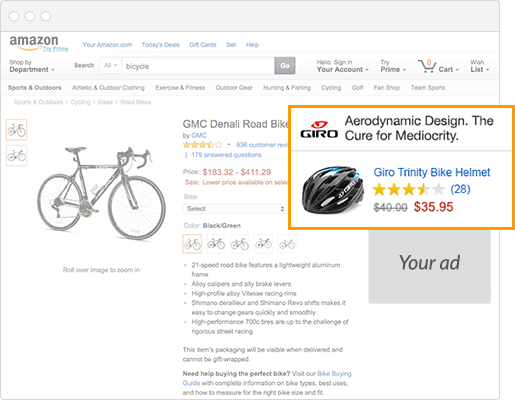 Competitor Branded Keywords: Target keywords of your competitor brands and products. This is done to increase the competence of your product. Complementary Product Keywords: Target products that are sold separately from yours but used together, each creating a demand for the other. Like when a customer is looking for a USB cable, Amazon display’s the adapter options for your phone as well. Sponsored Products Automatic Targeting Keywords: Target successful search queries from your Automatic Targeting Sponsored Products campaigns. These are for the products which are sponsored by amazon and are amongst the best-selling categories for that line of product. Out of Category Keywords: Target keywords which are not related to your product, but can pick up some of the out of category impressions to help drive buyers to your products. This a little crucial type of keyword and may or may not be successful for your campaign. Keyword Traffic Indicator: While creating your campaign, there is a ‘add your keyword’ section which indicates the keywords to be added for your campaign with a traffic volume indicator. The traffic volumes like high, medium, and low are based on estimated impression volume and relevance of ASIN’s. These keywords are based on bid pricing model. One should include medium and low traffic keywords given your budget constraints. A low traffic keyword increases your chances of winning the impression and it is based on your ability to use the keyword to your advantage to increase sales. Custom Headline: You need to use engaging headlines to attract your customer to your landing page. This can be done by using words like ‘exclusive’ or ‘new’ or even actionable phrases like ‘buy now’ and ‘save now’. However, it is essential to avoid any false claims by using words like ‘best-selling’ or ‘#1’. Testing: By incorporating more creativity you will tend to attract more customers than usual by changing headlines, brand names, customize and personalize the landing page, include more ASIN’s etc. It is advised to use the best practices as well like running simultaneous campaigns, giving one campaign a period of at least 2 weeks, changing one variable at a time and identifying the winning criteria based on your business goals and test set-up. ACos – Advertising cost and sales which is calculated by dividing the total cost of advertising by sales generated. DPV – Detail page views which are available under the campaign reports only. Using a permutation combination of such metrics one can customize the landing page by using ASIN mix. These points will help you to create a campaign which is best suited for your product and thereby increasing sales.